Congrats to the 2016-17 Reading Bowl Team for all of their hard work and a valiant effort! Check back at the end of the school year to discover next year’s list and information on the 2017-18 tryouts. 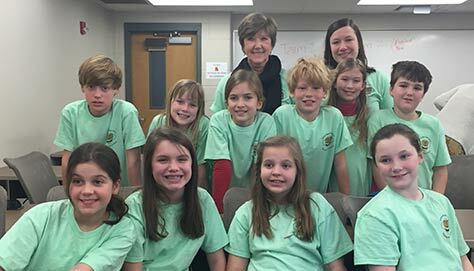 The Helen Ruffin Reading Bowl (“HRRB”) is a unique reading competition offered to 4th and 5th graders at Brandon. The “bowl” is a competition between schools and uses questions from the Georgia Book Award nominees in a quiz bowl-like format. In 2016-17 school year, Brandon will be competing for its 8th year. The team has placed 6 times in the District round moving onto Regionals at Clayton State University. Our 2013-2014 team made it even further and competed in Divisionals. Needless to say, our Brandon Bees are amazing students, readers and competitors! Turn in 10 Questions per book! To learn more, visit Mrs. Lander’s smore flyer here. © Copyright 2018 Morris Brandon PTA. Website sponsored and maintained by the Morris Brandon PTA.